Up until Friday I was with a small group on retreat in Cambridge House, part of Marygate House. 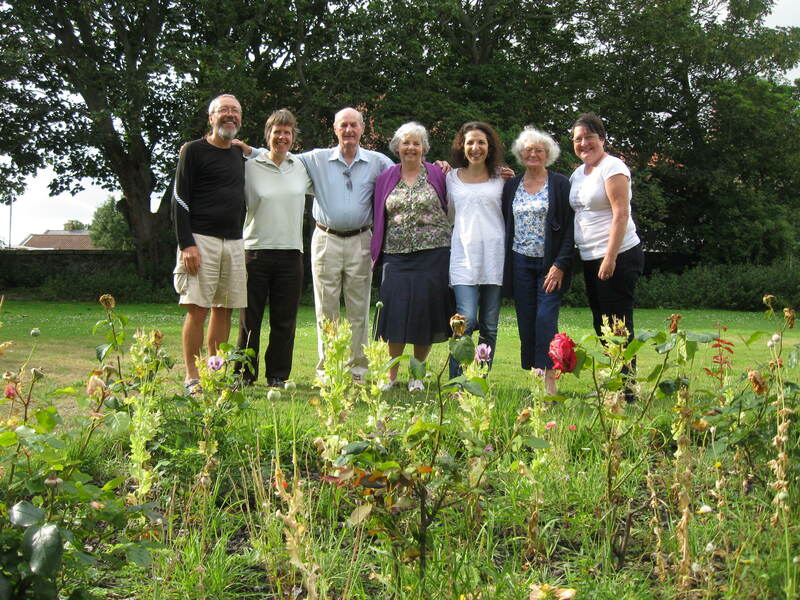 Even though we had never met before and were only together for a few days it became a real community – supportive, sharing and open hearted. Each of us felt this, and agreed that it was in part thanks to the “something special” on Holy Island. The atmosphere, history, the fact that it has been a place of prayer and pilgrimage for so many centuries. Even the fact that the island is cut off twice each day from the mainland by the tide seems to give life here it’s own peculiar and unique rhythm. Here we are, the “Cambridge House 7”. Since Friday I’ve been crashing with my friends Jo and Hayley, who are themselves in the process of getting ready to move house. Jo has been warden of Marygate but is on his way to a new job on another island, the Isle of Wight. I’ve been really grateful to them both for the chance to stay a few more days. Reading back through this blog there is an enormous amount of detail I have had to leave out. I’ve kept some written notes too, and hope to write more of a reflective journal of this time away at some point. The practical tasks of survival homeless away from home; the people I’ve met along the way, especially hitch hiking, as well as the solitude on some days; God’s provision and protection at each step of the way. Its a multi layered journey for sure, and I won’t return to London the same person who set out back at the beginning of July. Attempting to describe what I’m actually doing is evolving too. The word pilgrimage still fits, of course, but another equally good description of this project would be a “prayer walk” around the country. Walking and praying for each place I visit, the people I meet, everyone back home. Or even a “walking retreat” Walking, praying, hitch hiking, roughing it, and reflecting on 20 odd years in the field of homelessness. I’m certainly thanking God – and Housing Justice of course – each day for this wonderful opportunity. Tomorrow I set out hitch hiking for Glasgow, where my plan is to spend some time amongst those who are homeless in the city. I’m not going to claim that I’m homeless myself, or invent a back story, but simply take a few days in a low key sort of way to observe life on the streets, and manage without accommodation. 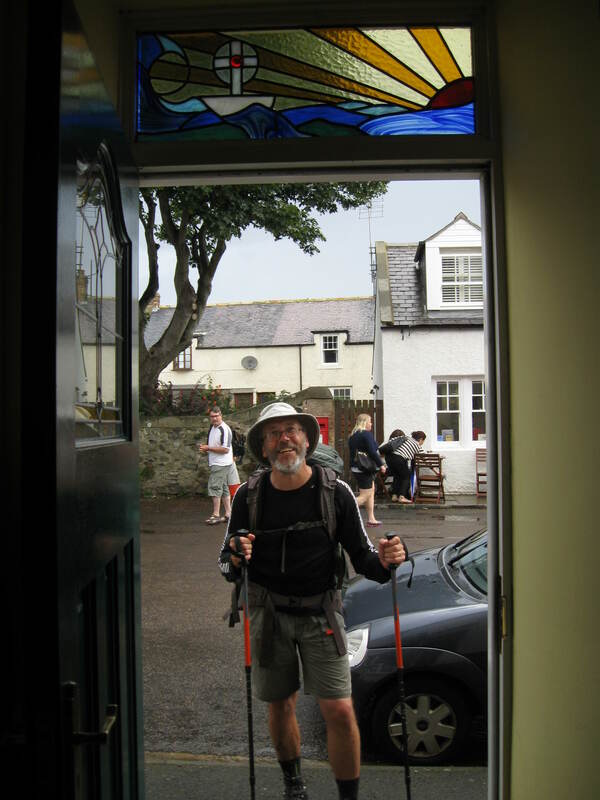 And the final leg of the journey – walking to Iona – will follow straight after that. 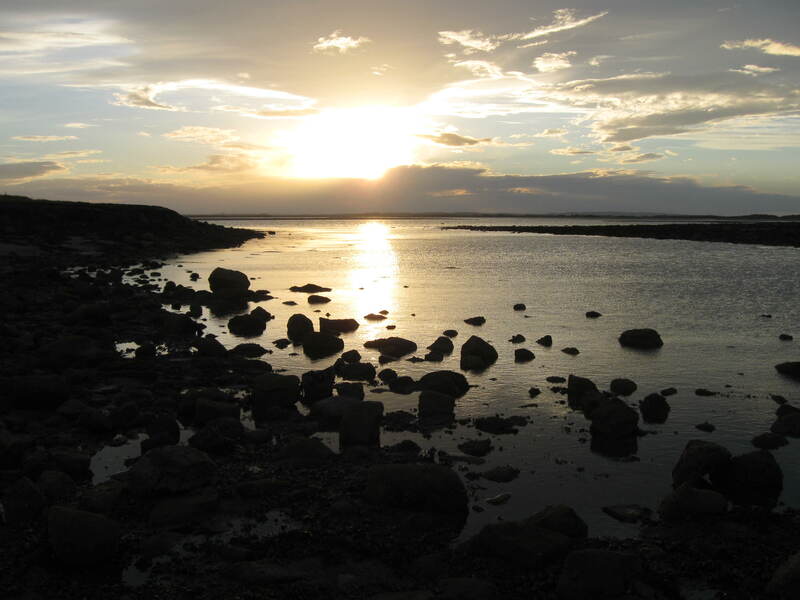 I have an offer of hospitality with Joyce, a friend of a friend who lives on the island, on the 21st and 22nd August. And my sleeper train back to London is booked for the 23rd August, arriving back into Euston early on the 24th. Not sure that I’m looking forward to that except that it is the same day that my wife Françoise and youngest son Theo arrive back in London from Brittany, following a visit to Françoise’s family there. Hopefully there will be opportunity to write a couple more blog entries before arriving back in London. 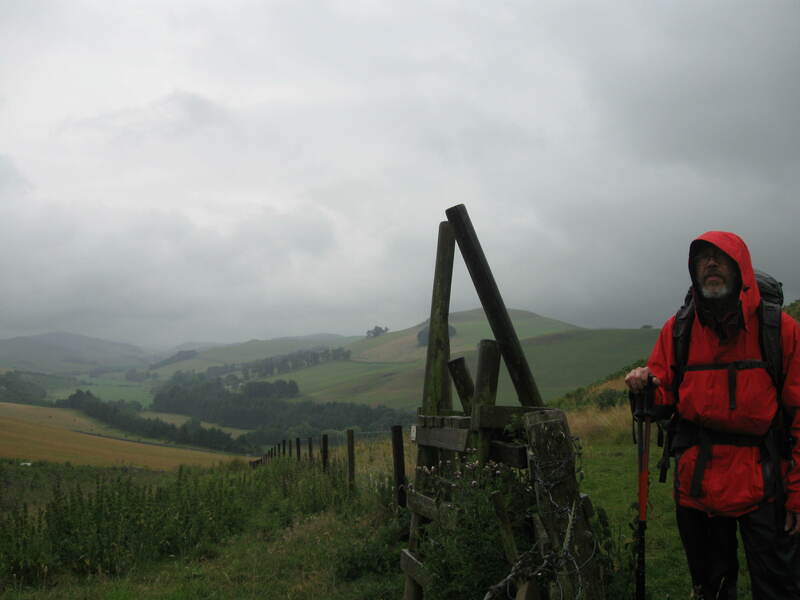 St Cuthbert’s Way was by far the toughest 63 miles so far. I finished it 3 days ago and still ache all over. The hills are strenuous enough, but one especially challenging point was when I and all the contents of my pack got soaked through in Saturday night’s rain, camping by Morebattle. Basically, this is what happens to idiots who leave their packs on the ground in the rain, instead of putting them inside a waterproof sack! Setting out on Sunday morning with a heavier than usual pack, it was also the highest and most arduous section of the trail. A place to rest and dry out was now a priority, so I prayed there might be a B&B with a vacancy in the next town, Yetholme. Arriving there late in the morning I found with immense gratitude a vacancy at The Farmhouse B&B at Kirk Yetholme. It did not surprise me that they were fully booked the previous and also following night! 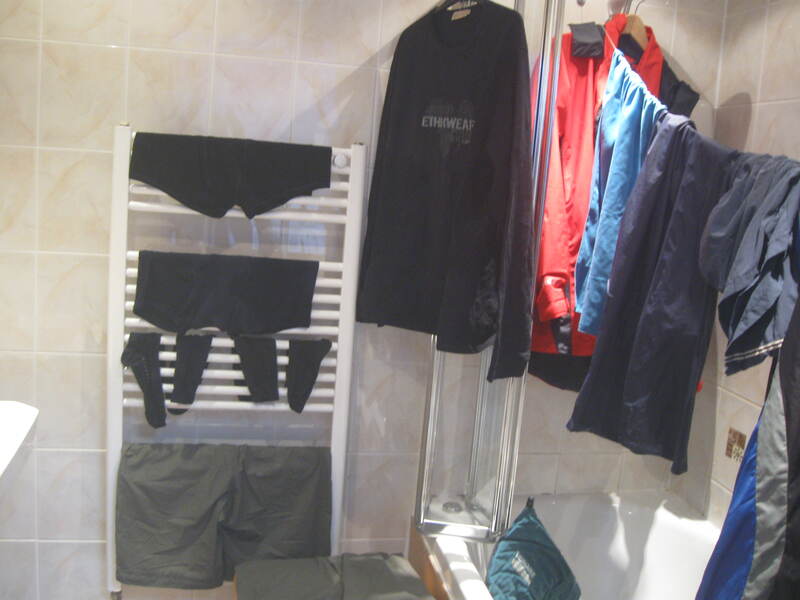 The room was ideal for my needs too – self catering, with a washing machine and a bathroom with a drying rack, for all my wet stuff. Dried out and rested, and fortified by an excellent cooked breakfast, the next day I walked to Wooler. Then on Tuesday I walked the last 18 miles to Holy island. In fact it was probably 20 as I managed to miss a way marker and took a very much not needed diversion between St Cuthbert’s Cave and Fenwick. So I reckon that by the time I reached Marygate House I’d walked more than 30 miles, cross country in 2 days. St Cuthbert undoubtedly did make the journey between Old Melrose Abbey and Holy Island, but I’d be very surprised if he walked via all the highest hills en route!